A new podcast experience exploring all the juiciness of living the good life. From champagne & caviar to digging your toes in the sand and the joy of children's giggles. Join Kimberly and company and learn how to turn the little moments into experiences of a lifetime! In this inaugural episode of Living the Good Life, veteran broadcaster Kimberly Henrie introduces the concept of the show with the tag lines: See good. Do good. Live good. 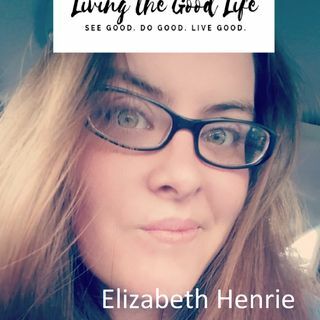 Collaborator Elizabeth Henrie joins in this ... See More mother/daughter chat about compassion, little ways to bring joy to a person's life and the ultimate princess bath. Kimberly explains the concept of the show is to focus on the good in a world that the negative is so easy to find and stress is rampant. She talks about contributing to the global economy of kindness and the importance of self-care. The ladies reminisce about using the good china for mac n cheese dinners and drinking water from a wine glass as ways to elevate the simple to special moments. Kimberly shares some special examples of acts of kindness, such as receiving flowers and freshly baked bread. Both ladies share their affinity for creating special gifts for people in their path. Who doesn't love a holiday cocktail to put you in a great mood, whether at a party or at home alone? Elizabeth shares her favorites to set a festive scene for the winter months. She also shares how she and her sister began the tradition as children at home. Festive cocktails are an awesome way to live the good life! Another must for good living? A princess level hot bath, complete with fragrant fruit and flowers. Elizabeth says this bath is even works princess magic on 60-year old men! Let us know if you try it!